↑ 1.0 1.1 1.2 1.3 "SIMBAD Astronomical Database". Results for NGC 2244. สืบค้นเมื่อ 2007-04-20. ↑ 2.0 2.1 Percival, S. M.; Salaris, M.; Groenewegen, M. A. T. (2005), The distance to the Pleiades. Main sequence fitting in the near infrared, Astronomy and Astrophysics, v.429, p.887. ↑ 3.0 3.1 Zwahlen, N.; North, P.; Debernardi, Y.; Eyer, L.; Galland, F.; Groenewegen, M. A. T.; Hummel, C. A. (2004), A purely geometric distance to the binary star Atlas, a member of the Pleiades, Astronomy and Astrophysics, v.425, p.L45. ↑ Frommert, Hartmut (1998) "Messier Questions & Answers". Retrieved March 1, 2005. ↑ Turner, D. G. (1979),, Publications of the Astronomical Society of the Pacific, v. 91, pp. 642-647. ↑ 8.0 8.1 Adams, Joseph D.; Stauffer, John R.; Monet, David G.; Skrutskie, Michael F.; Beichman, Charles A. (2001), The Mass and Structure of the Pleiades Star Cluster from 2MASS, The Astronomical Journal, v.121, p.2053. 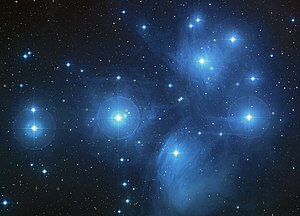 ↑ Moraux, E.; Bouvier, J.; Stauffer, J. R.; Cuillandre, J.-C. (2003), [http://adsabs.harvard.edu/abs/2003A%26A...400..891M Brown in the Pleiades cluster: Clues to the substellar mass function], Astronomy and Astrophysics, v.400, p.891. หน้านี้แก้ไขล่าสุดเมื่อวันที่ 23 กรกฎาคม 2560 เวลา 19:45 น.